The Xfce Design SIG aims at improving the usability and visual appearance of the Xfce desktop environment. Our goal is to bring interested users, designers and hackers together to ensure neither of them is working in a vacuum. By establishing a context in which they can collaborate on smaller and larger design-related projects we try to increase the chance of the proposed changes to be merged into the official Xfce repositories. Everyone is of course welcome to join this group which has already started working on several points and producing very interesting elements! I'll introduce here two of the main projects we are currently working on for Xfce 4.10. But more will follow soon! I would like to thank Simon Steinbeiß and Pasi Lallinaho from the Shimmer Project who played a crucial role in starting this SIG. I encourage you to have a look at the Wiki page linked above, which contains a very accurate description of what we want to achieve and how we are going to achieve it. You can see what is being proposed on this page. The goal is to produce a single interface allowing to quickly launch applications and to perform actions. We plan add an extension system similar to the Thunar Custom Actions to allow the creation of a tailor-made interface. 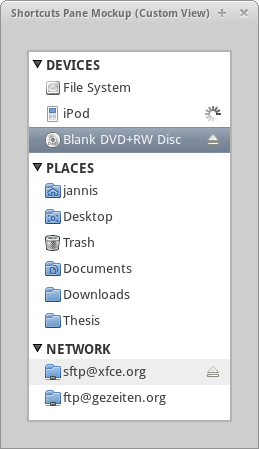 This is of course still work in progress, but this is how the two main view currently look. Clicking on the arrow on the right hand-side of the entry switches from one view to the other. We already received some mails and comments asking whether it meant that we would move towards a Gnome 3 interface. The goal is not (yet :D) to bring a revolution but rather to streamline what we currently have by improving the numerous rough edges. Of course, we might take some inspiration in other desktop environment but we will not copy what is done in Gnome 3 or KDE4, Xfce has its own philosophy which is serving its users well at the moment. Looking good! I like the suggested changes. The settings dialog will be reworked to make them more logical but merging Appearance, Window Manager and Window Manager tweaks is totally illogical IMO and will not happen like that. The relevant parts could be merged but we should not make the mistake of grouping everything blindly. jeromeg, why not just take the Style tab from Window Manager and merge it with Appearance, while the Keyboard, Focus, and Advanced tabs can be merged into Window Manager Tweaks for a more logical and consistent grouping? This is my opinion, but I wanted to share. My tip: Move the Trash icon at the end of the Places section. This is exactly, what would I do. Test git and I really like.. I want to make some suggestions.. I can write directly on the wiki? 1) Seeing the changes in Oxe, libxceui4, etc. It's time to add a new api for a widget?. Specifically, I want a new widget to display generic percentage information to port the plugins CPU, mem, swap, network, modem, wavelan, drums, etc., and thus get a homogeneous view of all the plugins. 2) I would like to see a new feature to tabwin. Add an icon at the end To display the desktop and windows 7. 3) Parallel to the new changes in thunar and appfinder, would be nice to see something similar on places plugin, and get a advanced applications menu for xfce panel like appfinder. How about finally implementing a file search function in Thunar which does not require the start of a separate application? A fle manager without a search function is ridiculous and unuseable. Thanks for your work! Also thanks for fixing memleaks in xfce4-xkb-plugin.